Joining the WordPress community in April 2014 was one of the best choices I’ve ever made. Although I should preface that with the fact that I didn’t immediately pick up on what many of those advantages actually were. My joining the WordPress.com community occurred at a time when I was engulfed in a curious kind of tunnel vision. That vision instilled in me the uncanny sense that I was somewhat like America’s early settlers…like those who picked up, left everything behind and moved Westward. I know that this sounds kind of weird…but I was striking out in my own for the first time, so, like the early pioneers, I imagined myself to be a trailblazer. The only difference was that nothing I was doing was remotely unique or groundbreaking. But for reasons I can’t really put words to yet, that’s exactly how I felt. I was so intent upon the ‘striking out my own with my very own website’ part that I completely failed to recognize WordPress.com’s social and community aspects. You can read more about my journey leading up to joining WordPress.com here. Maybe it’s because I was leaving a platform which was known for its strong community element. Or maybe it was because I didn’t yet really understand the broad range of characteristics that have come to define what a blog is today. I had never really considered blogs to be much more than personal journals…which was something I had no interest in. Nor could I imagine a set of circumstances under which that opinion would waver. Mine was to be a website filled with helpful information…not a journal of my hopes and dreams, or feelings and opinions, or even one in which I shared my artistic talents and growth to a larger audience. vsatips was to be a website filled with information which solved problems and improved people’s productivity, and which sometimes shared exciting technology news too. The excitement inherent to early exploration was my motivating force then and it continues to be now. What more can I say about that other than that my family always considered me to be kind of odd…I was most definitely and always, the ‘odd man out’ in that dynamic. Why Am I Beginning With My Beginnings at WordPress? The answer to that question feels eminently important to me…important for my readers to understand…hopefully my gut is right about this! I was so excited to finally be in control of my destiny, so to speak, that I missed out on a lot of the very cool features of WordPress.com. I instantly leapt into and became completely immersed in building my site and writing what I believed to be good content, in the hopes that I’d grow a solid readership base of like-minded individuals. Beyond that, my thinking never really ventured. I mean, I never really figured out the ‘why’ behind my goal and what about my goal was so important to me. The above is what I see at the end of one of my posts. Truthfully I still haven’t put a ton of thought into that aspect. I’m still really just focused on the goal…not so much on the ‘why’s’ of it. But, upon reflection, I do think I’ve figured that part out a little bit more. I realize that amongst my friends and family I’m unique in my interests. No one else even remotely shares my passion for mobile technology simply for technologies sake…if that makes sense. I’m just thrilled and fascinated that we can do everything we can with all kinds of technology today…but especially with mobile technology. The thought that I can carry around all the information that’s important to me in the whole wide world in one relatively tiny device, my cellphone, simply through the use of a few free apps…most notably iCloud Photos and Evernote…astonishes me! It’s just too cool for words imho! Using that as a vantage point, hopefully makes it easy to see why my endeavors to make sure that all of this miraculous ingenuity continues to work, seems to me to be, if not an admirable occupation, at the very least a worthwhile one. Being able to share that love with other like-minded people just seems to me to be a natural extension of all that. That’s one big reason why I continue to work at this almost 24-7. Another reason is because I’m determined to figure out a way to actually make a living doing what I love. While my 2nd goal may still seem to be somewhat intangible right now (or a pipe dream…where does that phrase originate from anyway? )…I’m a believer regardless. I truly believe that if I keep working at it, and keep loving it…only good things will follow…I mean, how can they not? 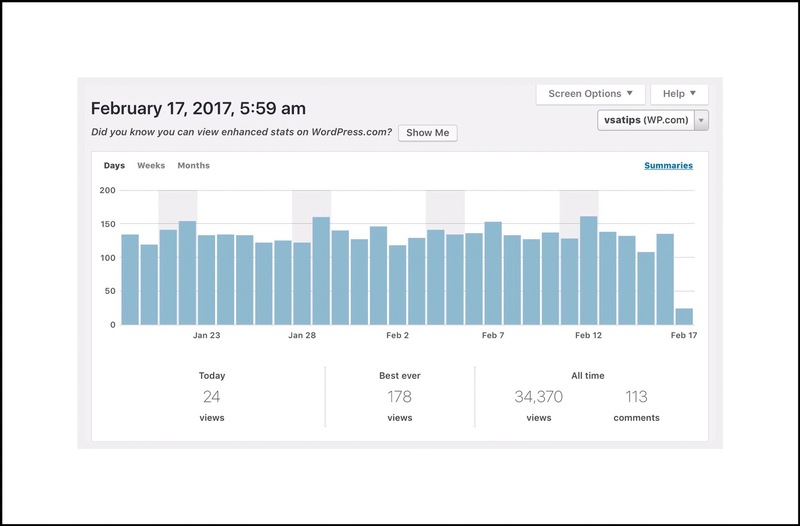 It’s also why I get super excited when I look at my WordPress Stats and see a large jump in my overall numbers periodically. I’m not entirely certain why my Stats periodically make these big leaps in numbers of overall viewers. I’m sure it has something to do with how active I am posting new material…I’ve noticed consistent correlations there…although my most recent jumps don’t bear out that supposition. Hopefully, the longer I do this the reasons behind the numbers will start to become more obvious to me. Because for me, I really believe that these ‘Views’ Stats are the most important factor I have in benchmarking or assessing my primary goal’s success. The main reason I believe my Stats are where I should place my main focus is because roughly 95% of my viewers arrive at my site organically. That’s a cool trendy word right now that essentially means ‘naturally.’ People arrive at vsatips because they used Google to search for a specific topic that I’ve written about. It makes complete sense to me that the organic nature of my readership places less emphasis on the ‘follower’ statistic and more on the ‘# of Views’ statistic. Also, it makes sense because most of the topics I write about were the direct result of my own encounter with a problem that I couldn’t find a good answer for when I searched using Google. If I figure out a solution to some problem, my assumption is that other people will encounter that same problem and will use Google for finding an answer. That also explains why my follower statistics, in the traditional sense, don’t seem to be really relevant for my sites overall success. But too I recognize that my thinking may be short-sighted. That’s what happens in a ‘tunnel vision’ scenario! That’s not too say that I’ve completely ignored my ‘followers’ statistics. I just haven’t really focused on them much. One big reason is because of a mistaken assumption I’ve held onto since the first day I began vsatips. I mistakenly believed that regular, everyday people couldn’t follow my blogs by using the email subscription option. I thought that WordPress required a person to have a WordPress account in order to be able to ‘follow’ other WordPress author’s sites. How did I arrive at this erroneous assumption you’re wondering? Shortly after I began my blog my son wanted to follow me in a noble gesture of support. In order to do so, he told me had to join WordPress. I was puzzled by that and so I explored it a little on my own. That was the conclusion I came to as well. Imagine my surprise when I discovered today that was not correct at all. This happened as I was I researching this topic again for a post I’m writing. But I approached the whole subject from a slightly different angle, and I learned that there really aren’t any restrictions for who can follow a blog. The follow mechanism, which is really just an email subscription readers can sign up for, means that they receive periodic emails based upon their chosen frequency, alerting them to any new content you’ve written. Anyone Can Follow Your Blog…All They Need is an Email Address! I read quite a few different WordPress support articles on the subject today. In none of them was it evident to me that the instructions applied equally to those people with and without WordPress accounts. I’m still a little shaken to think that I held such an erroneous assumption for so long! I’m a bit curious too to know if I’m alone in my misunderstanding. Even more puzzling is the fact that I actually mentioned this whole topic in another post I wrote about the WordPress Reader. 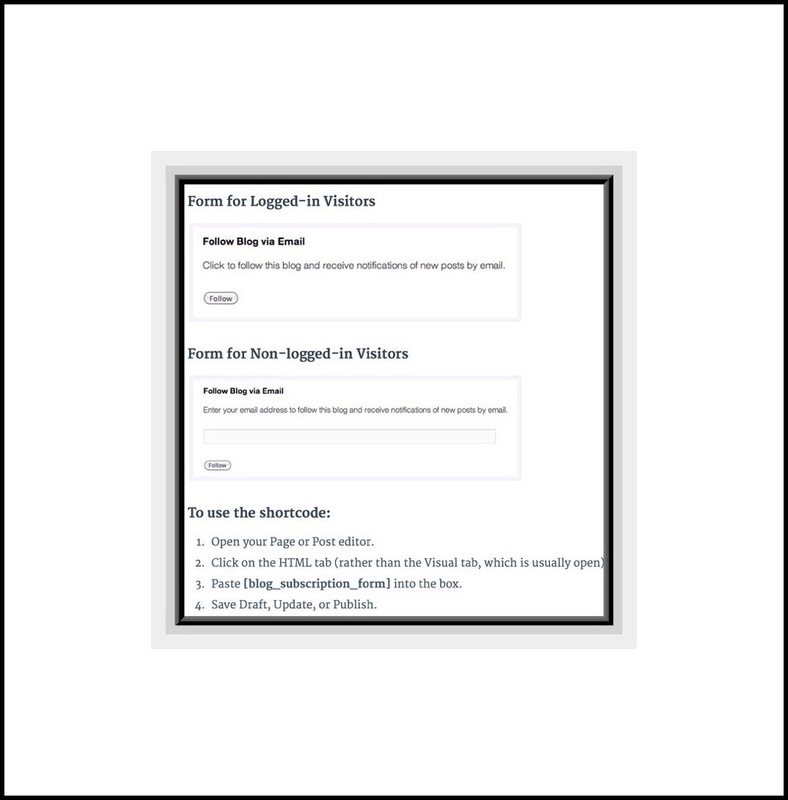 And at that time I discussed using a Follow widget for nonWordpress people to use of they wanted to follow your blog. 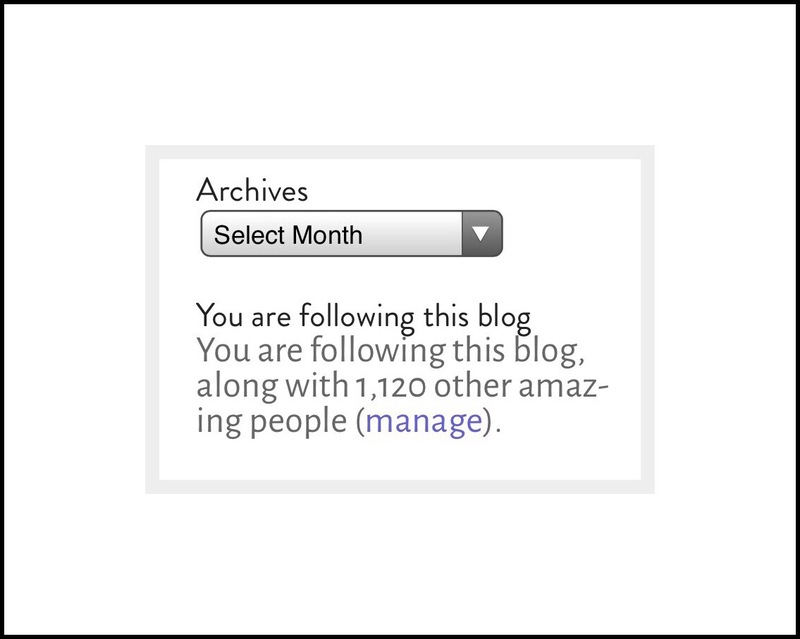 So apparently I wasn’t always unclear about this…I seemed to know at that time that it was possible for bloggers in WordPress.com to have nonWordPress followers. Which actually just confuses me a little more. Why was I so surprised when I discovered this ‘not new’ information today and why did I hold my mistaken assumption for so long? Is it because of the way things are worded in the built-in following mechanism that WordPress provides to us? Do the support articles use ambiguous wording? Or did I just misread them? I’d really love to know. Putting aside my confusion for a moment, one support article that I read today is responsible for helping me recognize my error. 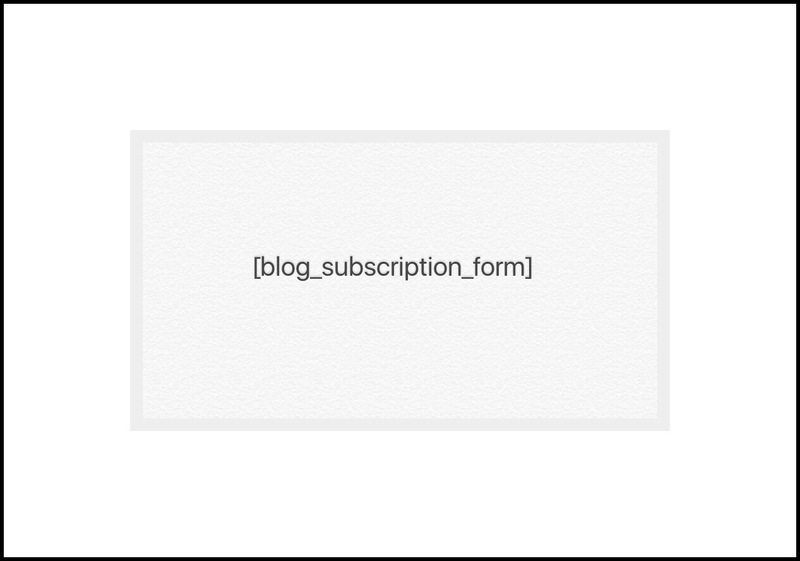 It’s an article about using short codes within the body of your post to provide readers with a way to subscribe or follow your work. This is a link to it. An example of how it functions should appear immediately below. Exactly what does appear below will vary based upon the circumstances. If you’ve already subscribed to someone’s blog, you’ll just see a statement telling you that. But if you haven’t, a form will be displayed that will give you the opportunity to sign up. The second method isn’t quite as easy, but it’s not really difficult either. It involves using a Widget. You can find all the Widgets available to you in the WP Admin Dashboard under Appearance. 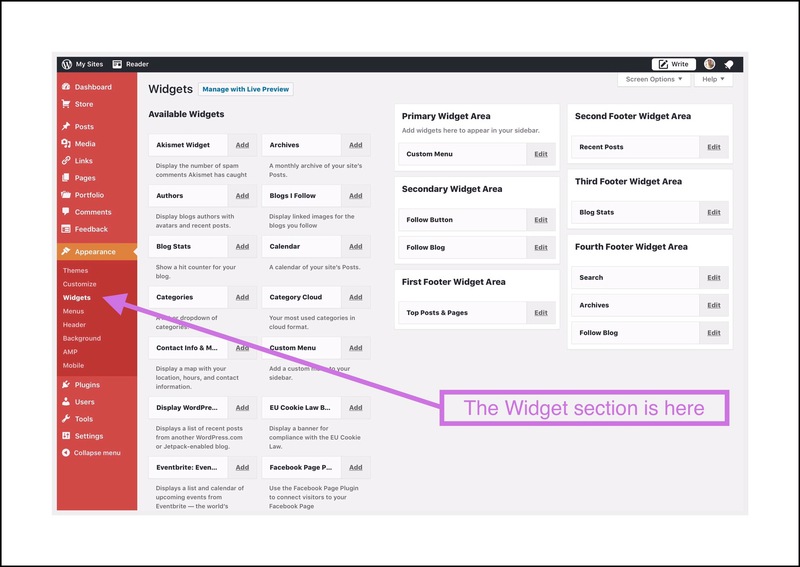 Here’s a link to the WordPress support article giving you step-by-step instructions for adding this Widget. 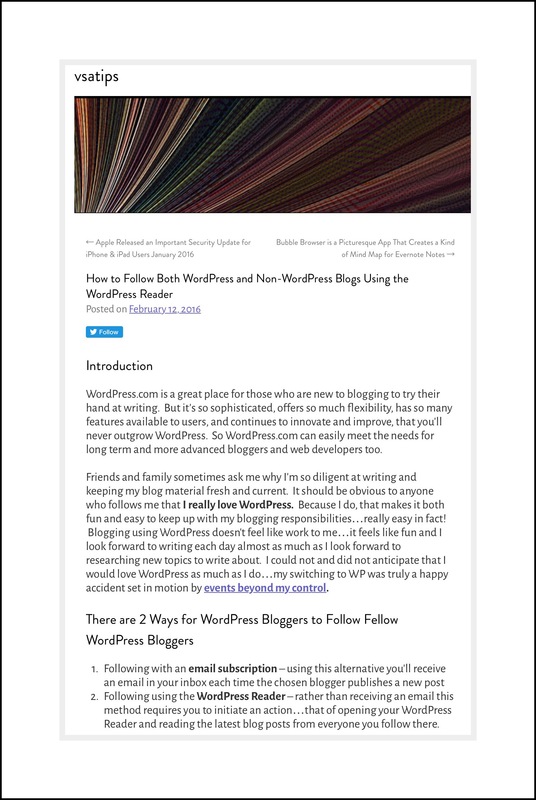 Quite some time ago I wrote a post about how much I like the WordPress Reader. The Reader is an RSS feed aggregator, which in laymen’s terms means that it’s a place people can go to read all of their news in one place. The reason I mention it here is because there is a 3rd way that readers can follow,your blog. That way is by using the reader. It’s a really cool alternative, but it’s limited only to those people who have a WordPress account. If you go to my post on the subject you can find out why I love this method so much and why I think the WordPress Reader is really amazing. It’s so amazing in fact, that I think people should consider creating a WordPress account just so that they can use the Reader as their news aggregator! Even though most of my readers are complete strangers and they arrive at my site from Google searches, I’m beginning to appreciate the nuances of having a loyal readership base as well. The idea of having a small community of people who love the same kinds of things as me is a really appealing one. Even more appealing is the concept of exchanging ideas and sharing the things we love. So, I’m hoping that by starting to focus on a more personal aspect of my blog, that maybe in time all my readers won’t be complete strangers from Google. Therefore I try to make it as easy as possible for readers by not requiring you to add your email address, unlike most comment sections you’ll encounter on blogs. I’ve gone a step further though because you don’t even need to include your real name. You do need a name of some kind…but that can be whatever you want it to be. This entry was posted in Blogging, Followers, learn to blog, Learning to blog. Bookmark the permalink.